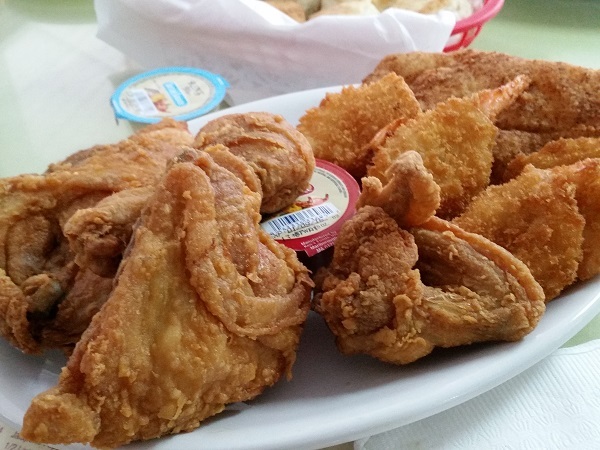 Beach Road Chicken Dinners, Jacksonville FL – Marie, Let's Eat! After spending the Saturday of our trip exploring Orlando, we left Sunday morning to spend a few hours with each of Marie’s parents on Saint Simons Island. The road there takes us through Jacksonville, and I was looking forward to trying a place that we’d been thinking about sampling for quite some time. 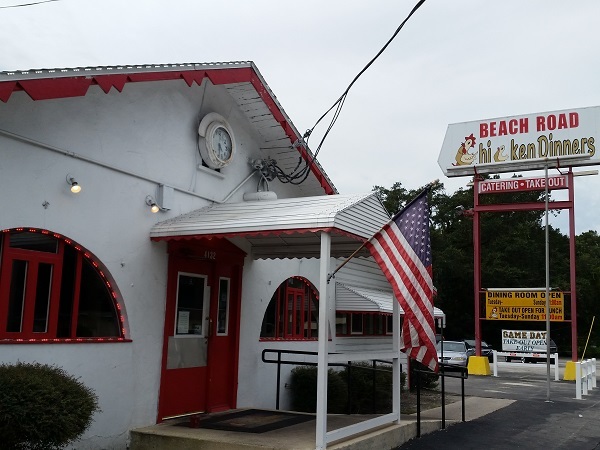 Beach Road Chicken Dinners originally opened in 1939, and we arrived just as the place started to fill up with both the after-church crowd and the Jaguars tailgating crowd. Since it’s one of the oldest existing restaurants in town, they’ve got a set, old-fashioned way of doing things. 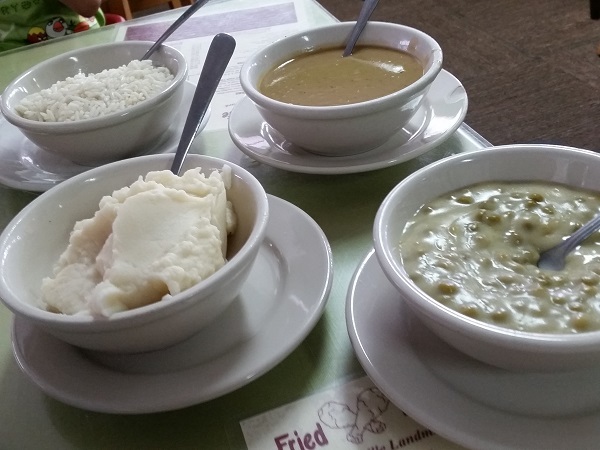 It’s not quite family-style dining, as everybody orders their own proteins, but they do offer up unlimited sides. This is actually a really great deal for budget-minded travelers, as you can order the right amount of food and pay a reasonable $5 sharing fee instead of going full price with every member of your party. We ordered a kids’ meal of tenders for the boychild, a two-piece chicken meal, and the Beach Road Feast for Two, which comes with four pieces of chicken, two fish, and six shrimp. That was plenty of meat for all of us, plus we could enjoy slaw, creamed peas, biscuits, rice, mashed potatoes, and fries. The same meal at one of those ghastly chain buffet places would have been more expensive and I very much doubt the food would have been as tasty. 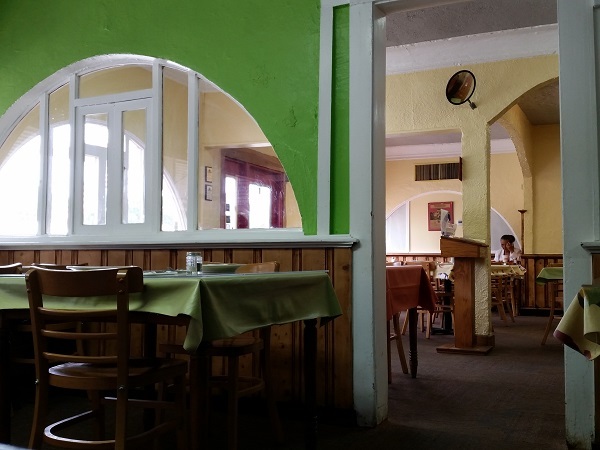 I got the impression that this restaurant has more than its share of diners who are even more budget-minded than us, however, as our server jumped in, and not in the most professional way, to intercept a possible misunderstanding about the sharing fee. The boychild can sometimes get even more mercurial than his teenage sister – and you didn’t think that was even possible – and he loudly announced, as she took our drink orders, “I don’t want ANYTHING!” The poor girl instantly told us “Well, you’ll still have to pay the sharing charge for him if you don’t order for him,” which, in the case of four year-olds is a little silly since the fee is a dollar higher than the price of a kids’ meal. No, we saved the buck and he ate a tender, but I can, sadly, believe that a restaurant with a policy this generous attracts one or two diners looking to argue a point! If you’re going to come here on a Sunday, come early, because the restaurant serves something like 500 meals every Sunday. Seventy-five years in business is enough time for a place to become a tradition, you know. Posted on October 19, 2015 August 23, 2017 by Grant G.Posted in chicken, florida, jacksonvilleTagged chicken, florida, jacksonville. WE HAVE EATEN AT BEACH ROAD CHICKEN DINNERS AND LOVE IT. WE USUALLY GET THE FEAST FOR TWO. IT IS ON THE OTHER SIDE OF THE RIVER FROM US BUT WE TRY TO EAT THERE A COUPLE OF TIMES A YEAR.